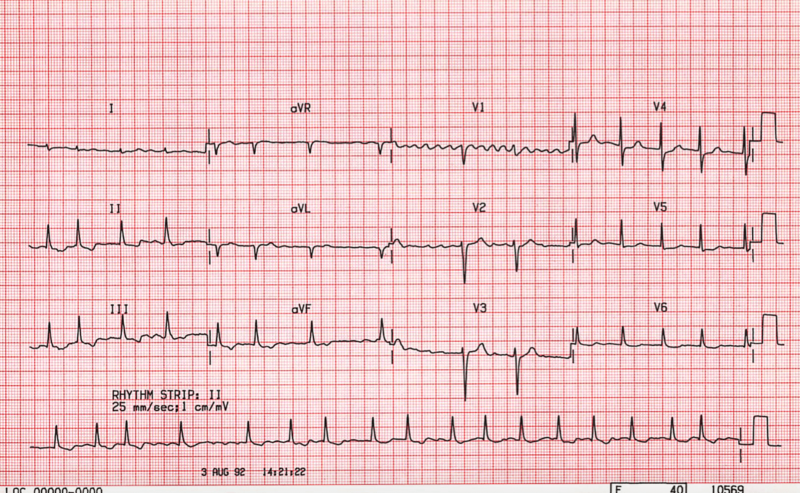 The ECG was recorded from a 71 year old man with chronic obstructive airways disease who was taking digoxin to control the heart rate in atrial fibrillation. Rhythm: No recognizable P waves or other form of co-ordinated auial activity is seen in any lead. The baseline is irregular and chaotic atrial activity is best seen in lead VI where a waveform irregular in both amplitude and frequency is recorded. The QRS complexes are irregular and the R – R intervals vary unpredictably. There is no recognizable relationship between the QRS complexes and atrial activity: atrial fibrillation is present. Morphology: There are downwards sloping ST segments in leads II, III and aVF. In V5 and V6 the ST segments slope downwards and the T waves are flat. These changes are non specific and may be caused by digoxin; it is not possible to diagnose ischaemia from this record. period of the dssues involved. In the absence of treatment or pre-existing disease of the AV node the resulting ventricular rate will be rapid as many of the atrial impulses which arrive at the AV node will be conducted. A ventricular rate in the range of 120 – 200 beats per minute often results. This is detected clinically as a pulse that is irregular in both timing and volume.